Is being photobombed really that big of a deal? 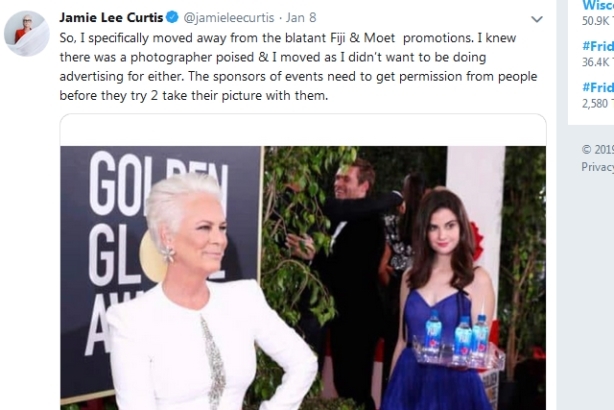 Screen legend Jamie Lee Curtis is probably opting for tap water instead of Fiji Water this week after a red carpet publicity stunt from the bottled water company at the Golden Globe Awards rubbed her the wrong way. Golden Globe viewers were highly amused by a Fiji brand ambassador/water-serving waitress preciousiously smirking her way into celeb photos. However, the "Halloween" actress definitely was not, posting on Instagram that brands should ask permission before photobombing celebrities. Should brands ask permission before photobombing celebrities à la Fiji Water Girl?